Easy, delicious, nutritious, and no need to turn on the heat! Salads are the way to go when summer rolls around, and Mother Nature provides such a bounty of fruits and vegetables at this time of year! If you’re into organic produce, take an early morning stroll on the weekend through your local Farmer’s market, and stock up on whatever is in season. The good thing about making salads is, chances are, you can substitute, eliminate, or add ingredients according to your personal taste, and it will taste just as great, maybe better! And don’t forget that fruit salads make a wonderful, refreshing dessert. Just chop them up, squeeze on some lemon juice, maybe a little honey or agave syrup, and serve. Or just serve one summer fruit, such as cherries or mangoes. I like to sprinkle sea salt and chili powder on mango slices. Try it! Keep the pantry stocked with a variety of canned beans to add to your salads for protein, such as black, fava, or lima beans, and/or your favorite cheeses. And frozen corn, peas, edamame, etc. are good to keep on hand as an addition when fresh might not be available. I like to keep limes and lemons handy to create my own salad dressings. To make sure I always have the juice available, I freeze some in ice trays and store the cubes in freezer bags. Have extra-virgin, cold-pressed olive oil available, and your favorite vinegars for salad dressings. I prefer balsamic or white champagne vinegar for most salad dressings, or rice wine vinegar for Asian style salads. 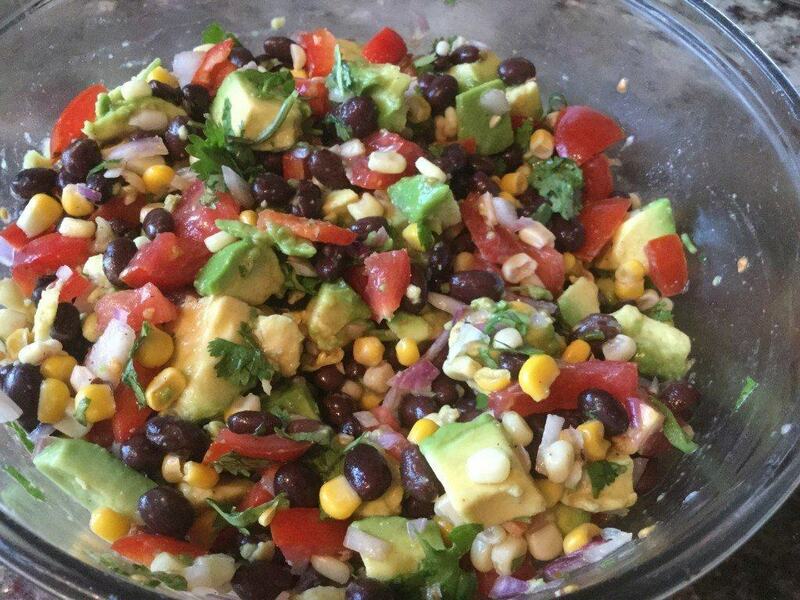 So here’s an easy, delicious Southwest style salad you can throw together in minutes, with lots of alternate ingredients. 1/;2 cup of red, green, or yellow capsicum (bell pepper) chopped. For more heat, use your favorite hot pepper. Throw all the vegetables into a bowl you’ve had cooling in the freezer (I add the avocado last, so it doesn’t start to oxidize). Squeeze the lime over the avocado. Toss all the ingredients gently. Now add last 4 ingredients, toss again, and adjust seasoning, oil, and lime juice to your taste. Let the salad sit for a couple of hours, if you can wait that long, to blend the flavours. Let me know what you think in the comments section below. Namaste, and bien apetito. So excited to make this this weekend! Yummy and heathy too! Let me know how you like it, and any changes you made! Thanks Mary! So glad you liked it. This is such a great time of year to enjoy all the fresh summer fruits and vegetables; light, healthy, and refreshing, a and I don’t want to turn the stove on in this heat.